We had a gamejam session this weekend. I decided to make a game using scratch. 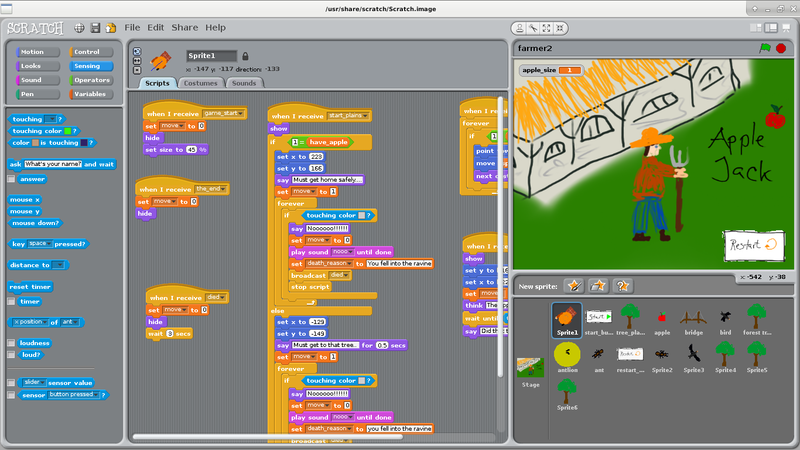 Scratch is an interesting programming language designed for people of age 8-16 years – so it far from what I am used to with python and the other “normal” programming languages. As the image shows, it is graphical programming. It is very understandable – probably for children also. I had sprites following the cursor in less than 10 minutes. It seems to be simple to use with GPIO on a Raspberry Pi. It is a binary file – not very git compatible. Version 2.0 is flash-based, so that open a whole array of problems. Graphical programming is not my thing. To me an issue is, that It is not copy’n’paste friendly and you need a good mouse. It is hard to maintain overview. Finding the correct structure takes some attempts – and no version control to help with the refactoring. All-in-all. it seems like a good candidate for making small games and animations. I’ll find some children to test it on. The code is here – go test and leave a comment.